It sometimes feels as though manufacturers name their products at random just to confuse us, but we’re here to help. This article is part of a new series called Market Watch that aims to help buyers understand different manufacturers’ naming schemes and the differences between the products they offer. 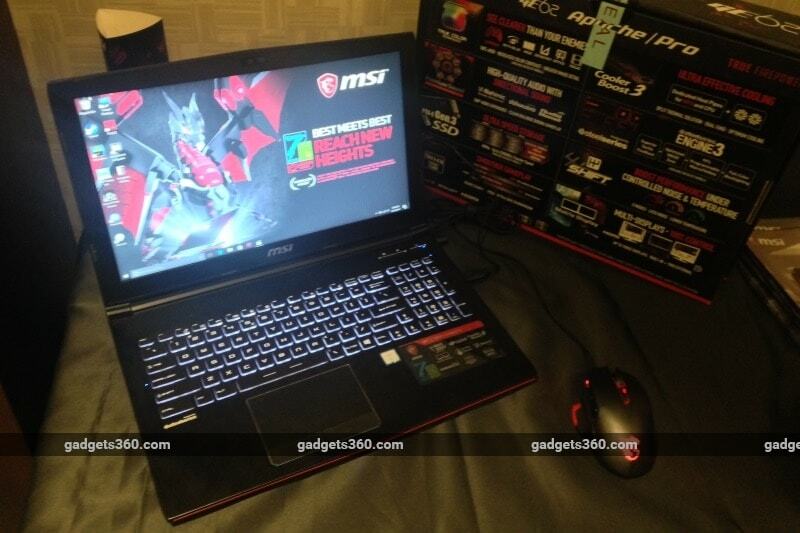 MSI is one of the few companies in India offering a huge range of gaming laptops. In fact, the company doesn’t sell any other kind, and is happy in its niche. At CES a few days ago, MSI refreshed its entire range to include Intel’s new 7th generation ‘Kaby Lake’ CPUs and some models even got a bump up in the graphics department thanks to Nvidia launching its GeForce GTX 1050 and GTX 1050 Ti for laptops. With these improvements, many of the new models are more than capable of supporting VR applications and headsets, and that’s reflected in MSI’s naming scheme. Unlike other companies that aim for rock-bottom prices and trim corners everywhere, we also see 4K displays, NVMe SSDs and other high-end features – with matching high-end price tags. In a rare turn of events, MSI unveiled its new models in India at the same time as they were being shown off at CES, with events in Mumbai and Delhi. MSI sells a huge number of variants in other markets with different screen sizes and GPUs, only a few hand-picked ones are listed for sale in India. Here’s a quick overview of the new range, and what you can expect if you buy a new gaming laptop now. Many of MSI’s laptops have names inspired by military terminology, or use words designed to connote power and strength. However, each model also has an alphanumeric identifier which helps you know exactly what you’re getting. The first two letters tell you what kind of laptop you’re getting. G is ostensibly for gaming, and the sequence from top to bottom is: GT, GS, GE, GP, and GL. The GT models are huge and heavy, and of course the most expensive, while the GL models are much more portable and are also the most affordable. The next two numbers tell you the screen size – with a few exceptions, the models all have either 17.3-inch or 15.6-inch screens. Higher-end models will have VR at the end of the sequence, telling you that they meet today’s minimum specs to run a VR experience. The second half of each product’s name tells you what kind of CPU and GPU you’re getting. All models listed here have suffixes beginning with 7, because they all use Intel’s 7th-generation ‘Kaby Lake’ Core CPUs. If the next character is R, you’re getting a 10-series ‘Pascal’ nvidia GPU, and if it’s Q, you’re getting an older 9-series ‘Maxwell’ GPU. Finally, the last character indicates GPU power, so F is more powerful than E, which is more powerful than D.
Finally, some models have their most notable feature appended to their names as well, so you’ll see SLI or 4K on the top-end models, and Pro on those which feature the most capable hardware. At the very top of the ladder, the GT series models are all massive beasts, and are meant for those who don’t spare any expense when it comes to gaming. We reviewed the enormous GT80 2QE Titan SLI and GT72 6QD Dominator G last year, and the lineup contains updates to both. 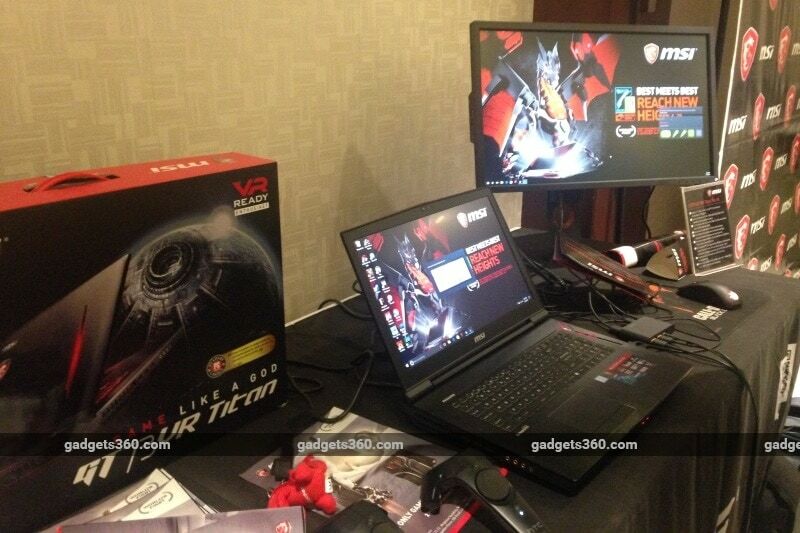 The biggest of the lot is the MSI GT83VR 7RE Titan SLI. It uses Intel’s top-end Core i7-7820HK CPU, which has four cores with Hyper-Threading and runs at up to 3.9GHz with an unlocked multiplier. Graphics capabilities are handled by two Nvidia GeForce GTX 1070 cards in SLI, and there’s 32GB of dual-channel DDR4 RAM. The display is an 18.4-inch full-HD panel with a matte finish for reduced reflections. There are two 512GB NVMe SSDs in RAID for a super-fast boot drive as well as a 1TB hard drive for additional storage and a Blu-ray writer if you still need to use optical media. The other defining feature of this model is its mechanical Steelseries keyboard, which uses Cherry MX Speed Silver switches and has RGB backlighting. You also get one USB 3.1 Gen 2 Type-C port, and Killer 802.11ac Wi-Fi and Gigabit Ethernet. Keep in mind that this “laptop” needs two enormous power bricks and weighs 5.5kg. All of this comes for a cool Rs. 3,49,990. 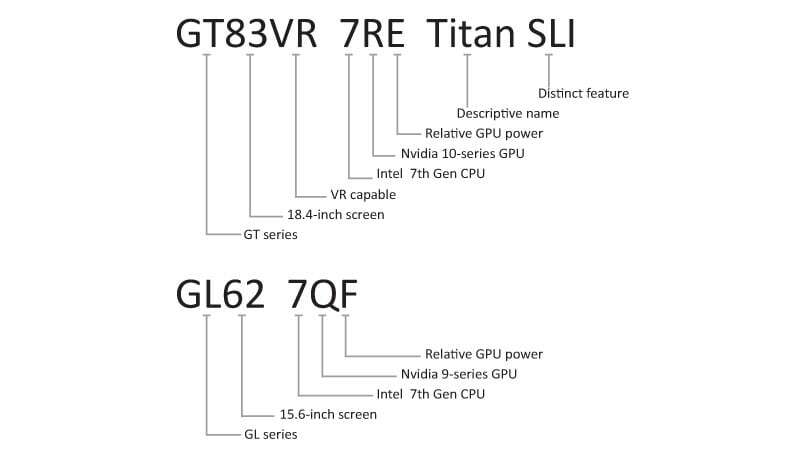 A little bit lower down the price ladder, there’s the MSI GT73VR 7RF Titan Pro 4K at Rs. 3,34,990. As its name suggests, it has a 4K screen, which measures 17.3 inches. The tradeoff for that is a single GeForce GTX 1080 GPU. Most of the other specifications are the same, including the CPU, RAM, storage setup, and connectivity, except for the lack of an optical drive, and a more traditional RGB laptop keyboard. The GT73VR 7RF Is slightly slimmer and lighter at 4.14kg as well. Rounding out the premium tier is the MSI GT72VR 7RE Dominator Pro. This laptop has a price tag of Rs. 2,19,990 and weighs ‘only’ 3.78kg. The specs step down proportionately, so you get a 3.8GHz Intel Core i7-7700HQ, 16GB of RAM, a single GeForce GTX 1070, and a single 256GB SSD plus the 1TB hard drive. The monitor is a 17.3-inch full-HD panel and you do get a Blu-ray writer. For enthusiasts who don’t have bottomless wallets, MSI offers the GE series. You still get the latest hardware, but there are fewer frills. The MSI GE72MVR 7RG Apache Pro offers a Core i7-7700HQ CPU, 8GB of RAM, and a 256GB SSD plus 1TB hard drive. This particular model has a GTX 1070 GPU and a 17.3-inch full-HD screen, and costs Rs. 1,85,990. There are also variants with the GeForce GTX 1060, and the brand new GTX 1050 Ti, with 15.6-inch full-HD screens. The GE62VR 7RF (15.6-inch, GTX 1060) is priced at Rs. 1,39,990 and the GE62 7RE (15.6-inch, GTX 1050 Ti, which notably costs it the “VR” tag) sells for Rs. 1,29,990. We reviewed last year’s MSI GE62 6QD Apache Pro model and found it to be an excellent choice except for the lack of an SSD, which appears to have been fixed in this year’s lineup. MSI sells only one GS model in India, and it’s smaller and lighter than the ones listed so far because it ditches some of the high-end hardware options which would have required heavy-duty cooling systems. It’s designed for people who want to carry a laptop around every day and do more with it than just play games. The MSI GS63VR 7RF Stealth Pro, priced at Rs. 1,77,990, is the direct successor to the MSI GS63VR 6RF Stealth Pro which we reviewed just a few months ago. As its suffix suggests, it uses a 7th-gen Intel CPU rather than the 6th generation. You get a Core i7-7700HQ processor, 16GB of RAM, a 256GB SSD plus a 1TB hard drive, and a GeForce GTX 1060 GPU. The screen is a 15.6-inch full-HD panel, and you also get Thunderbolt 3. All of MSI’s new models up to this point come with a gaming bag and a two-year warranty. There’s a considerable price drop when stepping down to the GP series, which makes these models a lot more attractive to mainstream gamers. There’s a definite emphasis on value, and you might not be able to push the latest games at their absolute highest quality settings. Note that VR has been dropped from the model names, as the specifications might not allow for a reasonable VR experience. Interestingly, there are two models with the exact same name, MSI GP62 7RD Leopard, and they have only one very subtle difference. The model priced at Rs. 1,09,990 has a GeForce GTX 1050 GPU with 4GB of VRAM while the model priced at Rs. 1,05,990 has the same GPU with only 2GB of VRAM. All other specifications are the same. You get a Core i7-7700HQ CPU, 16GB of RAM, a 128GB SSD plus 1TB hard drive, and a 15.6-inch full-HD screen. The Wi-Fi controller is powered by Intel rather than Killer, and the keyboard backlight is only white rather than RGB. There’s also a Type-C USB port but it runs only at USB 3.0 speed (5Gbps), not USB 3.1 Gen 2 (10Gbps). All that comes in a package weighing 2.4kg. You get the two-year warranty, but not the gaming bag. These are MSI’s most basic models, and they are priced right within the sweet spot that many buyers in India look for. If you have the budget for a premium laptop, you could easily afford one of these. However, the spec sheet is relatively sparse. The MSI GL62M 7RD model retains the 7th-generation Core i7-7700HQ CPU and 15.6-inch full-HD panel that its bigger siblings have, but steps down to 8GB of RAM and a 1TB mechanical hard drive with no SSD. The GPU is a GeForce GTX 1050 with 2GB of VRAM. There’s also no keyboard backlighting or Steelseries endorsement. This model is priced at Rs. 89,990 but you can get the GL62 7QF model with a previous-generation GeForce GTX 960M GPU for Rs. 76,990 if you’re willing to step down, which isn’t really recommended. 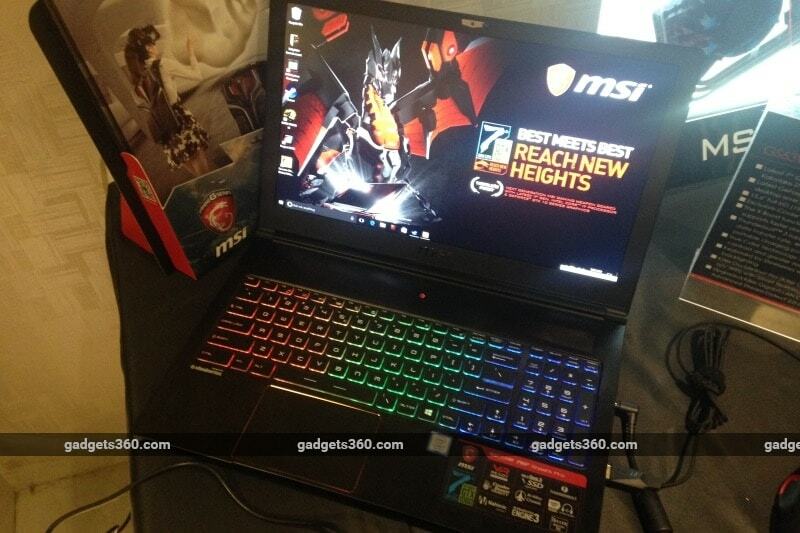 MSI doesn’t really sell non-gaming laptops in India, because it would rather not compete with mainstream brands. However, recognising that there is a market for reasonably priced premium laptops which can also handle light gaming, there are two more options: the MSI PE60 7RD and the MSI CX62 7QL. The first of these has the same Core i7-7700HQ CPU as its far more expensive siblings, matched with a GeForce GTX 1050 Ti GPU. There’s 16GB of RAM and a 15.6-inch full-HD screen. Storage is only mechanical, in the form of a 1TB hard drive. Interestingly, it has a white backlit keyboard. It has a silver metallic body that stands out from the rest of the lineup which is all black and red. It’s priced at Rs. 84,990 but comes with only a one-year warranty. The lowest-end machine of the entire lineup is the MSI CX62 7QL, and it uses a low-power Core i5-7500U CPU with a previous-gen GeForce GTX 940MX GPU, which should just about be able to handle very basic games. This is also the only model with a low screen resolution of 1366×768 pixels, but it does still have 8GB of RAM and a 1TB hard drive. It’s priced at Rs. 53,990 and has a one-year warranty.